People are facing lot of hazards in checking their land details in government offices in Punjab as it is very time consuming process. 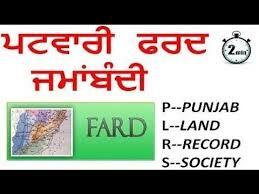 A revolutionary reform taken by Punjab government in making all the land records available in online so easily by logging into PLRS FARD Government website. People can login to this website anywhere anytime for view of agricultural documents for enabling easy verification's. In this portal all agricultural land details are updated by Revenue Department. People of Punjab can use of this service to view their agriculture land details using digital technology by sitting at home or anywhere you like. It is a most advanced technical and innovative facility provided by Punjab government which can can be easily downloaded all the land document from anywhere anyplace and anytime. After entering or selecting required details it gives full information of our land like Khewat number and other required details. People are not needed to visit taluk offices for such records anymore to get certified by authorities, which saves lot of time. PLRS is nothing but Punjab Land Record Society established in 1860 headquarters at Jalandhar, Punjab. FARD Kendra is a computerized facility where people of Punjab get their land records details. 1.Go to the http://plrs.org.in/ (or) click the below link to access. 2.Click on FARD image to get your Land Record details and select your language. 3.Select your District, Tehsil, Sub Tehsil, Village and year, then enter it will open the Nakal Page. 4.In this Nakal page there are 4 options to choose based on Jamabandi, Mutation, Roznamcha and Mutation after registration. 5.If you choose Jamabandi Nakal then just click on Jamabandi by providing Name or Khewat Number or Khasra Number or Khatoni Number to view report..
6.If you choose Mutation then click on Mutation by entering the required number to view report. 7.If you choose Roznamcha then click on Roznamcha by entering rapat number to view report. 8. If you choose Mutation after registration then click on Mutation after registration by entering Vaseeka Number or Mutation Request Number or Transaction Number to view report.